X-Men: Children of the Atom ( エックス・メン　チルドレン　オブ　ジ　アトム Hepburn: Ekkusu Men Chirudoren obu ji Atomu) es un juego arcade que fue producido por Capcom y salió para la placa Arcade CPS-2 en 1994. Fue conversionado a Sega Saturn en 1995, PC en 1997 y PlayStation en 1998. Es el primer videojuego de Capcom en utilizar la licencia de los personajes de Marvel. Este juego junto con "Super Street Fighter II" es considerado como uno de los primeros juegos en popularizar el super salto, super combos y los Tech Hits, mediante los cuales un agarre puede ser negado al oponente. En cierta manera el juego es precursor de la serie de juegos de Marvel vs. Capcom, en la cual se combinaron elementos de Street Fighter Alpha para formar X-Men vs. Street Fighter. ersonaje Oculto : Akuma, también conocido como Gouki, es muy similar a su encarnación de Super Street Fighter II Turbo. Él es seleccionable mediante un código en la pantalla de selección de personajes. X-Men: Children of the Atom (Japanese: エックス・メン　チルドレン　オブ　ジ　アトム Hepburn: Ekkusu Men Chirudoren obu ji Atomu) is an arcade game that was produced by Capcom and originally released on the CP System II arcade hardware in 1994. 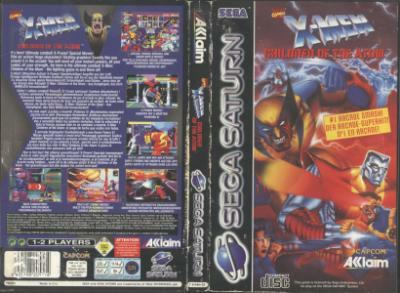 Ports of the game were released for the Sega Saturn, PlayStation and personal computers. Of these, the PlayStation version was not as well received as the other versions, suffering from slowdown and missing frames of animation. X-Men follows the same fighting game controls and conventions Capcom previously established with the Street Fighter II games and the original Darkstalkers. The player can choose between one of six X-Men members or four of their enemies (for a total of ten selectable characters) and proceed to compete in a series of best-two-out-of-three one-on-one matches. The player has an "X-Power" gauge (similar to the Super Combo gauge in Super Street Fighter II Turbo and the "Special" gauge in Darkstalkers) that builds as the player performs regular or special moves. X-Power gauge starts at Lv. 1 and reaches Lv. 2 when it becomes half-full and an Aura will begin to surround the player's character until it becomes full and reaches MAX level. Players can then perform an "X-Ability", which consumes a small portion of the X-Power gauge, or a "Hyper X", which consumes a greater portion of the same gauge. Breaking one's fall from a throw or performing a counter-throw will also consume a portion of the X-Power gauge when performed. Other features introduced in Children of the Atom include Super Jumps, the ability to roll away or towards an opponent after falling, the ability to determine the aim of a projectile move (such as Cyclops' optic blasts), and the ability to pursue an opponent after performing a throwing attack for additional attacks. After selecting a character, the player can choose between "manual" or "automatic" blocking. By selecting to automatically block attacks, some features will not be available during gameplay. The single-player mode consists of six CPU-controlled opponents and two non-playable boss characters. Unlike some games, the player cannot play against a clone of their own character. Akuma from Super Street Fighter II Turbo appears in the single-player mode as a secret opponent at the sixth match if the requirements are met. The game is loosely based on the "Fatal Attractions" storyline. The main antagonist is Magneto, who plans to unleash an electromagnetic pulse on the Earth that will disrupt the magnetic fields and create havoc on the world's electrical systems ushering in a Dark Age for Earth's non-mutant population. With the promise of a mutant-run planet, the X-Men's most formidable foes join forces with Magneto.